Meeting Minnesota’s electricity demands mainly through renewable energy would keep the electric system reliable, drastically reduce greenhouse gas emissions, and save the average household thousands of dollars. That is the conclusion of a new study conducted by Vibrant Clean Energy for the McKnight Foundation. The study examined options to achieve Minnesota’s statutory goal of reducing greenhouse gas emissions 80% by 2050. To do so, it concludes, we must reduce emissions in electricity generation by 91%, use electricity more for transportation and heating, and increase energy efficiency. The study finds that the combination of electrification, renewables, and efficiency would bring energy costs down. Electricity rates would reduce as older, less efficient power plants are replaced by low-cost renewable energy and because of increasing economies of scale. The additional electricity that consumers would use for transportation and heating would cost less than the gasoline, natural gas, or other fuels currently used. The report estimates an average household could save $600-$1,200 each year. The study recommends that coal-powered generation be retired as quickly as possible, and finds that no coal power is needed after 2030. Some natural gas-powered electricity generation will be needed to balance out intermittent wind and solar power and in case of extreme conditions. However, the study recommends that Minnesota not increase the amount of natural gas generation beyond what existed in 2017, and it finds that using much lower amounts of natural gas generation might save more than $60 billion. In addition, the study reports that relying on natural gas generation will actually cause greenhouse gas emissions to increase after 2030. The renewable-dependent electricity system would be reliable, the study says. The model matched electricity use to supply for every 5-minute interval without fail, and kept an additional 7% of electricity capacity waiting in the wings in case of emergency. No model can predict the future, and this study is not a crystal ball. However, it’s yet another a strong indication that we should continue to focus on increasing energy efficiency, and that we should look carefully at the long-term costs and all energy options before making any new investments in fossil fuel electric generation. New power plants take decades to pay off. Coal and nuclear plants around the U.S. are already being priced out of operation by lower-cost options before they’ve been fully depreciated. This study highlights that today’s new natural gas plants risk a similar future. The study illustrates that a high-renewables electric system is in consumers best interest: renewable energy will not only dramatically reduce emissions but also save money. 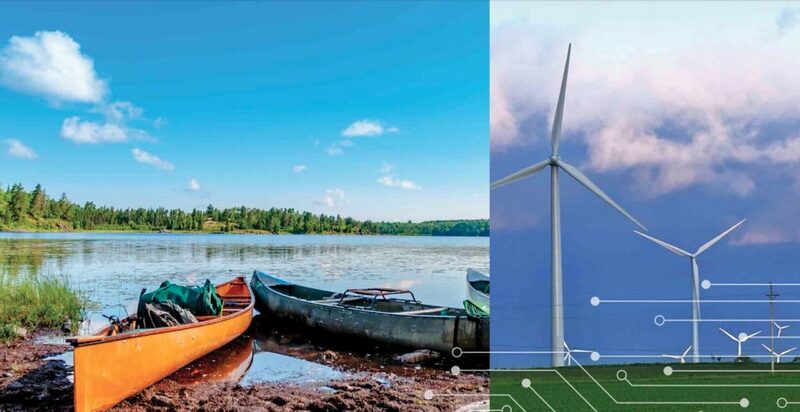 It confirms that Minnesota utilities (Xcel and Great River Energy) are on the right track to pursue 50-60% renewable energy or more by 2030 – and that an even faster transition to renewables could be possible and more affordable. You can read Vibrant Clean Energy’s full report or an executive summary online. The McKnight Foundation also supports CUB.